At a trial now under way in San Jose, Calif., Apple is trying to prove that Samsung illegally ripped off its distinctive iPhone design. Here's a look at how Samsung's phones have evolved over the years. 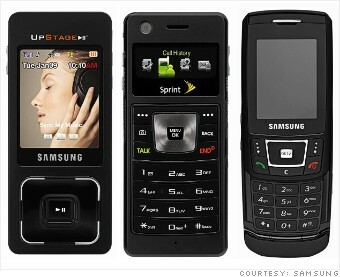 The bulk of Samsung's pre-iPhone offerings for the U.S. market were bar-type phones, sliders and flip phones such as the BlackJack (center) and D900 (right). They came in the same familiar shapes being produced by most cell-phone manufacturers. The F300 (left), which boasts two LCD screens -- one on each side -- was included by Samsung in its trial brief in a graphic purporting to demonstrate Samsung's early-stage touchscreen design. However, the 2006 phone has no true touchscreen capability, only the ability to scroll by swiping your finger along the edges of the sensor button.